Grand Cayman is a large island that is centered between many common ports on Western Caribbean cruises in the waters between Honduras, Jamaica and Cuba. 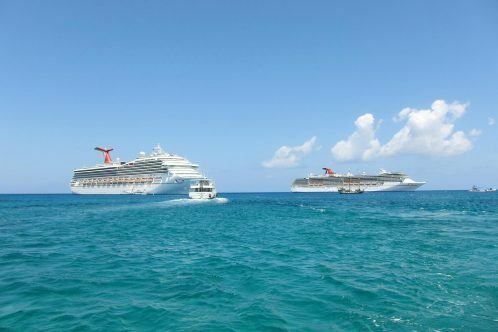 With its popularity amongst big cruise lines and beautiful natural wonders, there is no shortage of Grand Cayman excursions to choose from and guests can pick from relaxing and serene beach trips to adrenaline fueled adventure tours. Many Grand Cayman cruise excursions are family friendly, taking advantage of the area’s shallow waters and abundant wildlife; however, there are numerous ways for adventure seekers to get their blood pumping when visiting Grand Cayman. From high above the water’s surface, to deep down below and everything in between, adult visitors with a penchant for heart pumping exploration will find more than enough exciting things to do in Grand Cayman, and we’ve put together a list of the five best. 1. Stingray City: One of the very most popular attractions on Grand Cayman is Stingray City, a shallow watered area where the flat water gliders gather en masse to provide sheer delight to visitors. It’s one of the most well known Grand Cayman cruise excursions, and while it’s exciting in itself, a little adventure getting there can be the icing on the cake. Jet ski tours to Stingray City give weary boat riders a chance to get the salty sea air in their face at high speeds jumping from wave to wave for their chance to encounter some of Grand Cayman’s most popular natives. The ride to the sandbar where the stingrays congregate lasts up to twenty minutes and gives way to half an hour of petting and feeding in a mere three feet of water. 2. Horseback and Snorkel Charters: There are numerous opportunities to mount a horse and experience the quiet and beauty of the beach on Western Caribbean cruises. But, the horses here don’t mind getting wet themselves and have little problems venturing out shoulder deep into the surf. The tour also adds in one of the most popular Grand Cayman cruise excursions as the horseback ride gives way to beach front snorkeling opportunities to get a different perspective of the wildlife below the water’s surface. Various types of horseback tours are offered on Grand Cayman, but swimming with the horses is undoubtedly one of the most unique adventure tours on the island. 3. Deep Sea Fishing: Given the prime deep sea fishing along the wall of the island, it’s not a wonder that these types of adventures are some of the best Grand Cayman cruise excursions available. Half day tours aboard thirty one foot ships allow guests opportunities to try their hands at reeling in monster marlins, local wahoo and familiar tuna in a watery battle of the species. Full day tours are also available where mahi-mahi and tuna found over ten miles from the shore can be found. These Grand Cayman cruise excursions are typically more expensive than snorkeling adventures or historical tours but make for some of the very best deep water fishing in the Caribbean. 4. Scuba Diving at The Wall: Temperate waters and a lack of currents make Grand Cayman a beautiful and exciting sweet spot for scuba diving and cruises to Cayman Islands aren’t complete without a dive deep down below. There are numerous scuba diving Grand Cayman cruise excursions to choose from, including beginner lessons for the less experienced. But, for seasoned divers who have spent many hours thirty feet or more from the water’s surface, master dives with expert scuba guides on one of many scuba Grand Cayman cruise excursions mean one hundred foot deep dives amongst the island’s intricate coral displays giving way to shallower dives weaving in and out the exciting sunken ships that litter the coast’s sea floor. It’s a truly unique experience and one not to be missed for those craving a little adventure mixed in on their Western Caribbean cruises. 5. Parasailing: Parasailing is considered one of the ultimate thrill rides and allows those with enough courage to catch rare glimpses of Grand Cayman and its beautiful turquoise waters from up high above. Guests can soar on the wind at speeds high enough to get the adrenaline pumping, but gentle enough to ensure that you don’t miss a thing. Past guests note that while parasailing Grand Cayman cruise excursions are easily bookable through their cruise lines, massive savings can be had for those who plan ahead and book privately, where discounts of up to half can be achieved.